If you're already bored of Super Mario Run then fear not - Nintendo's latest smartphone release is available to download right now on iOS and Android devices. Fire Emblem Heroes is a tactical RPG based on the popular fantasy series and features loads of characters from previous games. It's entirely free to download, but unlocking some features in-game requires the use of Orbs, a premium currency which can be purchased using real-world cash. Orbs can be acquired through normal gameplay, however. * It is possible to play the game for free, but some features require the use of Orbs, which can be purchased with real money. You can also earn Orbs for free. If you're looking for the iOS version click here. Android users should click here instead. We'll be reviewing this one soon, but in the meantime let us know your early impressions by posting a comment below. Oh yes this is going to be amazing. Can't be downloaded. After 3 restart, it downloaded the opening movie. Really enjoying it a lot! Good luck trying to get it to work. I managed to get though the prologue then the constant communication errors just got too much for me. Not out for me yet. Still showing the pre-register link. Just noticed in the thumbnail that Camilla is in. The "a game you can play with one hand" jokes are really hard to resist. Played a little on the train to work this morning - seems pretty decent so far. 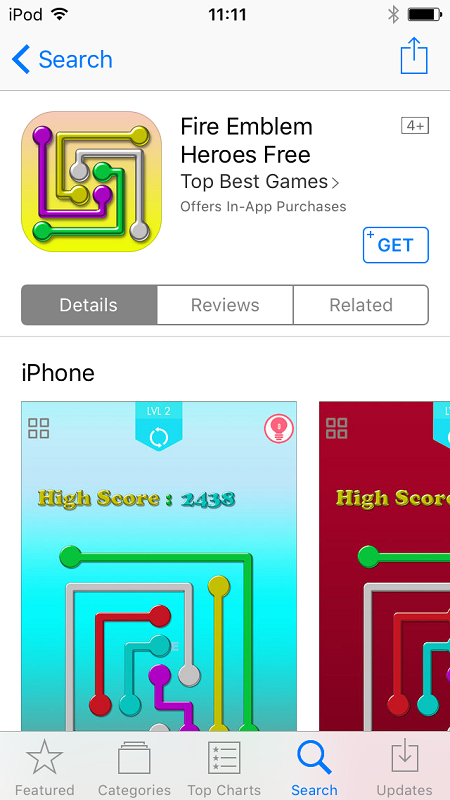 Australia App Store has it available now. Just have to scroll down the search results a little. Got bored of waiting, so I downloaded Yu-Gi-Oh Duel Links. Really fun game, actually. It keeps the cards from the first 2 seasons of the TV show (aka the good ones), and they brought back the VAs for the characters in the show. I've had a blast, but my phone nearly died, so it's charging now. Played it for half an hour this morning before work, not really a huge FE fan but after playing the prologue I'm actually really enjoying it! I dunno, but it seems more fast paced than a usual Fire Emblem game? Really chuffed that my first orb pick was a four star Robin. Enjoying it so far. Still not a huge fan of the artstyle! The game would be 10 times more awesome if they used GBA-like sprites. Looks very fun nonetheless...... although I can't seem to find it on the NA app store? I found it. 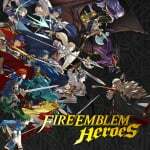 The genuine game is #10 in the list when you search 'Fire Emblem'. I should have searched 'Fire Emblem Heroes'. Downloaded. Will give it a bash tonight. When they say "internet connectivity required to play", I take it that's all the time, and not just a licence check? Be patient people. The Errors are caused by server traffic. I've now managed to download onto my iPad and Android - nice that you can link your account to both devices and cross-play your save file! Very slick game by the way! Andoris user in the US here. It's not available. Is this post just for EU users I assume? I'm assuming that that the US stores should have it in an hour or two. I love it. Completed chapter 2 already. I'm hooked. Still not available for me on the NA GPlay store, it'll show up eventually. I downloaded it, but got an error after starting the game when it annoyingly tried to download an additional patch. I'll try again later. I hope it comes to the Canadian store soon, so I can download it before I go to work. It says "no available yet in the canadien store"
I've got an Ipad air 2, iOS is updated. That strange that we, Canadiens, don't have the game while USA does. @MetalKingShield unfortunately that's correct. ......annoying to say the least! Yeah I'm bored of Mario Run. But the thing is, I got already bored when I saw it the first time in a video. Don't worry, I've also seen it in real life, but it's still boring to me. I really hope this thing comes up in the US sometime soon. I got to get to work soon. I don't think it's out for me even though I live in the US. Oh well. Time to download an apk! still not out in the us. will check later tonight. The app is out already, for people who can't get the game in the Google store. @Captain_Gonru I keep telling you, Nintneod and their wonky online issues. We'll see what happens when Switch launches and MK8D releases, people are just going to LOVE paying for service like this. I'm still at Registered on Android in the US, 8AM eastern. NL is just trolling us west of "the pond". This article was published 3 hours ago. I live in the US and I have an iPhone. It's not abolanle for me yet. Not up in NA yet. Arg! There are, however, some new My Nintendo rewards up for the game. 10 free orbs! @Nin_Myski We actually don't have it either. @Kalmaro Thanks for the heads up! @Nin_Myski I'm in the USA and it's not available to me yet as well. Had to drag myself off it so I can get to bed get some sleep and play again in the morning. It still says to Pre-Registrar on Google Play, is it not available yet in the USA? @Captain_Gonru You would think all of this would happen after mid-night, it's all electronic, but who knows. Normally I blame stuff on Reggie sleeping in on the west coast but this is on Google Play I would think. Though who knows, could be Reggie. Thursday is my busy day, probably have to wait until tomorrow anyway for me. Can't play it on my iPad Mini because the game crashes after 20 seconds (even though it plays fluidly the rest of the time - and before anyone asks my device is not jailbroken or anything) and my Android phone is not supported at all. Great! Just downloaded it, i really really like it! I hipe they bring these simple free games to the eshop for the switch, its fun on the go. Nice, i got Chrom the first summon and korin the third summon. I don't usually like mobile games, but I like this. Is Permadeath an option? I'd like to be required to think instead of mindlessly initiating attacks with no consequences. Lame. Still not available in NA. If anyone wants to friend request me in game my ID is 0232317370. Think im going to lose a lot of time on this game, pity it drains my battery pretty quickly. @Porky Something tells me that permanent losing characters that some may have paid for is a bad idea. Not up in Oregon yet. Oh well, that's just time for me to do my daily Miitomo and Pokémon Shuffle. In North Carolina it is 11:45am. Nothing yet. If I get time between Yu-Gi-Oh! Duel Links, Pokémon Sun and Minecraft I'd like to give this game a go. Not sure I could give a genuine turn-based RPG the attention it needs. Even if I do looove them! Still showing up as Pre-registered for me on Google Play and it's not even showing up on the ios app store. Okay what gives? It's past 1pm on the East coast and still nothing. Are we waiting for noon on the west coast or something? @NIN10DOXD : Howdy neighbor! I'm now going to blame Trump every time something funny goes on with my Asian imports lol. Those that still can't get it could consider downloading the apk from any website that has it and install it directly themselves. I did. It was supposedly not compatible with my android phone according to the Google Play Store. I downloaded the apk manually and installed. Runs like a charm. So the policy seems to be "we flag it incompatible on phones on which it runs really well, but we push it to devices that can't run it properly like the iPad Mini". Still in "pre-register" phase for me, here in NA (East Coast). Wow, didn't expect "her" of all people to be the commander. 2:10 pm EST, still no Fire Emblem. Makes you wonder if this is Nintendo adjusting to turning 3rd party in the near future once the switch bombs as why would you release a game on a rival gaming platform. It's good. The prices for orbs are disgusting though for how many you get. @wizzgamer No way Nintendo is going 3rd Party. UPDATE: Now live in US! Currently Live in US on Google Play! It's live for me on the US East Coast, but I had to close my Google Play Store app and re-open to make it stop showing "Registered." Anyone have it for iOS yet?? @Enigminator Thanks! Sick of arbitrarily waiting for it to appear on Google Play. Gotta love APKs! I cannot download it!? "Not compatible" (HTC One M8) - anyone else? @Captain_Gonru My phone told me to download it, I can never remember My NNID or pswd so that's as far as I got. Still not sure about the tablet. So, online connection issues huh? Shocking. @Captain_Gonru My tablet is ready, but I need 9.67MB and I'm not in the mood. That's probably shocking too. I have had the error 803-3001 a good few times already, forcing me to reinstall the game and resync my save data from my Nintendo account. That's particularly disheartening so far. A lot of people seem to be running into the issue too, both on Android and iOS. @sp_initiate-001 I got that issue on my iPad Mini, the game kept crashing. @H1rul3 My phone was also supposed to not be compatible (Wiko Wax) but I installed an apk downloaded from the web and the game runs just fine on my phone (aside from the aforementioned issue which I read is happening to some people on iOS as well so that can't be because I downloaded an apk). At any rate, you may want to consider doing the same thing if you want to play the game. You have to allow installing from unknown sources in the settings of your phone if you have never installed a downloaded apk file. Got it. Not bad. Wait till you get first 20 orbs, then spend on summons. Max out castle as soon as possible for Xp Bonus. Rally Rally Rally, it's good. @H1rul3 Same here, I had to download the apk from online. @NintySnesMan Nintendo's mobile strategy is to entice smartphone players to their game systems, not drive them away. We saw it work wonders with Pokemon Go!, so it's proven to be an effective strategy.